This instalment of You Make the call involves an employee who verbally threatened a co-worker in the co-worker’s office. Justin Chislett was a driver for Waste Management of Canada (WMC), a provider of waste disposal and recycling services in Fort McMurray, Alta. On Sept. 19, 2012, Chislett discovered his designated truck had a lockout tag on it. Lockout tags were used to inform a driver his vehicle needed service and shouldn’t be operated. However, Chislett felt the lead mechanic at the facility, Chandra Perera, was picking on him by placing the lockout tag on his truck. Chislett became upset, stormed into Perara’s office and began yelling at him. Chislett was escorted out of the office by two other employees, worked for a while and then went home. The next day he came to work but wanted the day off due to stress. This employee said he felt the need to step in between Chislett and Perera as Chislett was moving towards the latter and he thought Chislett was going to resort to physical violence. WMC investigated, obtained written reports of the incident and suspended Chislett with pay. During the suspension, WMC determined Chislett breached the company’s zero tolerance policies on harassment and violence. Chislett’s employment was terminated on the day of his return, Oct. 11. The union filed a grievance, arguing termination was too harsh. Chislett acknowledged he didn’t handle himself in a professional manner and his treatment of Perera was unacceptable. He also said he was stressed out at work because of other contributing factors, and he lost his temper, though he stated he was “still frustrated with Chandra for what happened.” He apologized for his behaviour in the grievance hearing, but did not officially apologize to Perera or WMC. Was Chislett’s threatening behaviour just cause for dismissal? Should the company have meted out lesser discipline? If you said lesser discipline was warranted, you’re right. The arbitrator agreed Chislett’s comments “could easily have been interpreted to threaten violence” and both Perera and the other employee believed Chislett was about to attack Perera. In addition, there was “no true apology” from Chislett and he admitted to still holding Perera partly responsible. However, the arbitrator found WMC’s harassment policy to be “confusing,” as it referred to harassment in the context of discrimination but not threats. In effect, Chislett’s misconduct did not violate the harassment policy, just the violence policy, said the arbitrator. The arbitrator also found WMC’s anti-violence policy was not a zero-tolerance policy. It referred to violence being “grounds for appropriate disciplinary action, including termination,” but didn’t stipulate a breach would result in termination regardless of the circumstances. The arbitrator noted this was Chislett’s first offence and, though Perera thought there might be physical violence, Chislett did not attempt any physical violence. 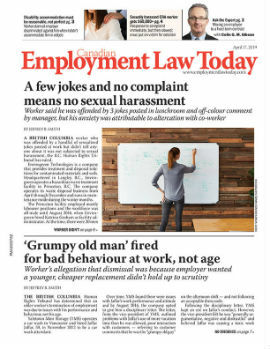 “While there was cursing and abuse by (Chislett) and the behaviour could objectively be described as a threat of violence towards a co-worker, the threat was more in the nature of words and I am not convinced that any physical harm would have resulted,” said the arbitrator. The arbitrator found while there was a general threat, there was no specific threat to physical violence. While specific threats should be dealt with more harshly, general threats should have some leeway. The arbitrator ordered Chislett reinstated with a lesser penalty such as a suspension — the union suggested two weeks — leaving it to the union and WMC to settle on appropriate discipline. • Waste Management of Canada and CAW, Local 4050 (Chislett), Re, 2013 CarswellAlta 2179 (Alta. Arb. Bd. ).